Cort the Sport: USAT Age Group Nationals: "Write the Ending You Want"
USAT Age Group Nationals: "Write the Ending You Want"
Where to start?? I had SO much fun racing last weekend, SO much fun. The general consensus was the combined field of 4850 triathletes was by far the most competitive Nationals ever. 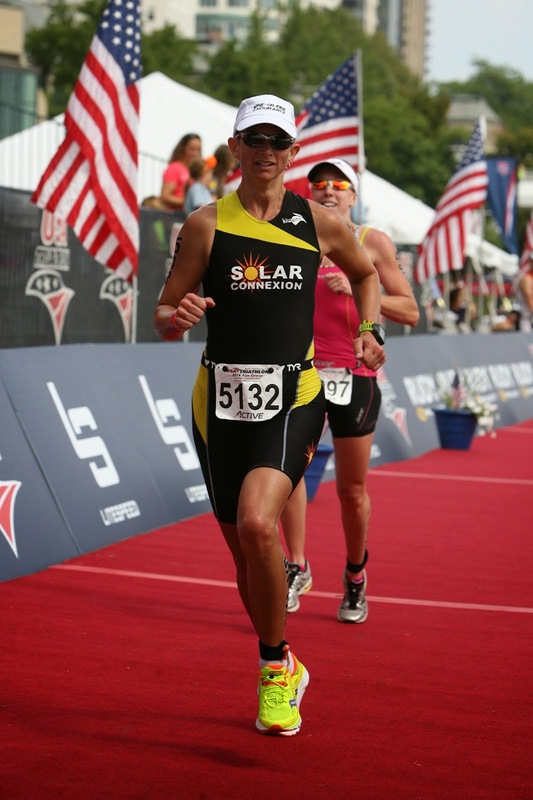 There were crazy fast people in every age category, with most of us racing our hardest for a spot on Team USA at the 2015 ITU World Championships slated for Chicago. Since we are the host country, we get 25 rather than 18 spots per age group, but because Worlds are a year after Nationals, when we are all a year older, we get ranked for spots according to our age group at that future time. So, when I was compared to the 44-48 year olds (rather than my 45-49 age group), I finished 15th and qualified 15th for the Sprint Distance, and in the Olympic I finished 19th, but qualified 26th because of so many speedy 44-year-olds. So I'm very happy to have made my fourth consecutive Team USA for the sprint, and if I get an Olympic spot that will be "gravy"! What kept rolling through my head this weekend was "write the ending you want." I have long thought of Nationals as an end point to my recovery, a goal I have focused on since surgery. I wanted an end to this chapter that I could be proud of. "Write the ending you want" reminded me that while I surely don't have control over everything (and wouldn't want to), I had a control over a lot of things - staying calm (peaceful mind), thinking clearly, racing smart, "turning the screws" on myself, being patient as needed, and staying tough and positive. I'm pretty satisfied with how I "wrote the ending!" 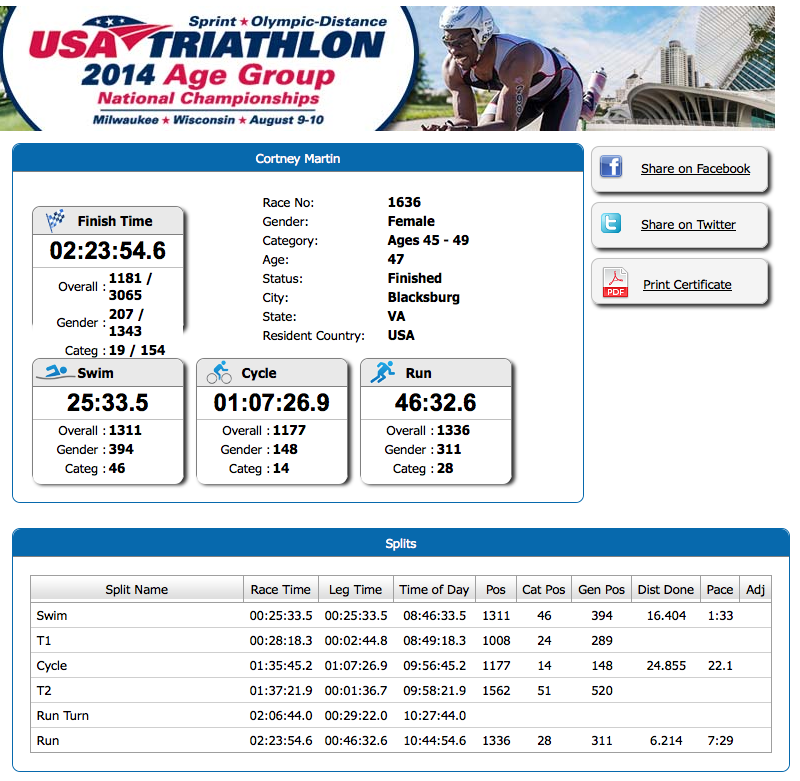 Below are all my race stats if interested. 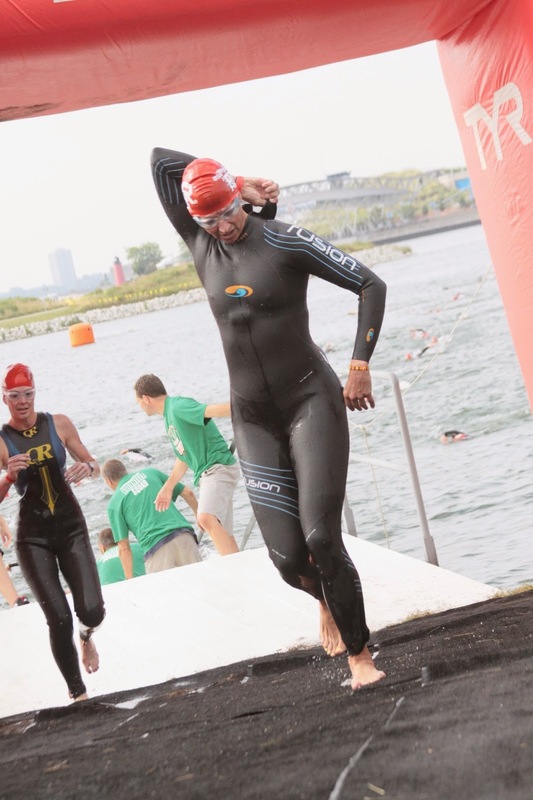 The bottom line is, I took a significant amount of time off my swims compared to the prior year (1:33 in the sprint and 1:39 off the Olympic), and biked and ran about a minute slower. But I got everything out of myself that I could on the day and held a pretty good "redline" heart rate on both runs (Garmin Sprint, Garmin Olympic) that told me I couldn't have done much more. I always want to be faster, but at the same time, I am content to know I did my very best on the day with the fitness I had. Rather than blather on about the race, I think I want to share some random "lessons learned" from the weekend to share with others who might race at Nationals or similar big race in the future. Go to packet pickup as early as you can. Big races = big lines. Big lines = keep hydration with you at all times, maybe food too. If you think it's a good idea to go to packet pickup just before the 2-hour swim practice block, chances are that 500 other people had the same "good" idea and will be in line in front of you. Go to packet pickup as early as you can. Did I mention that already? Hit up the merchandise tent immediately if you want any event shirts, jackets, etc. We got jackets, not t-shirts for this race, so when I went to get a race t-shirt on Friday, they were already sold out!! This is the case for Worlds too - stuff often sells out day one! 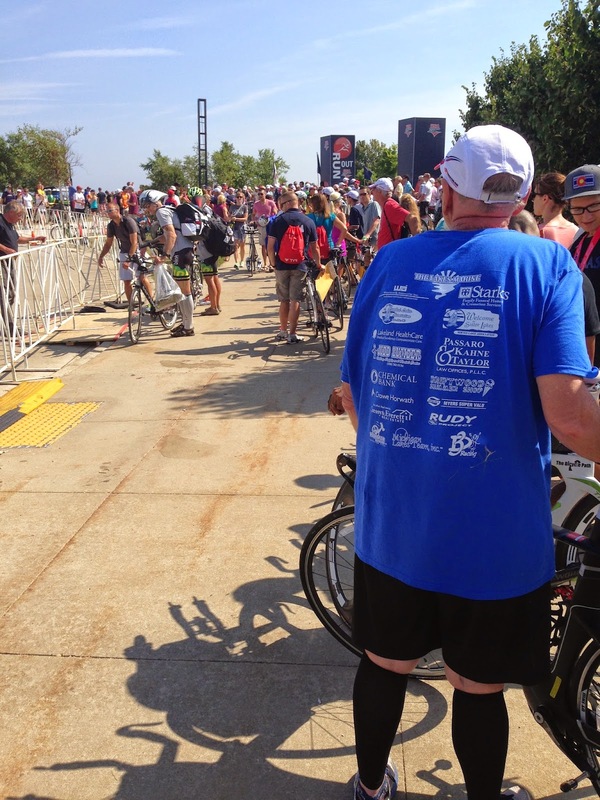 Before race day, scope out the port-o-john options for the ones that are just off the "beaten path" - near the expo, or bike mechanic. It's usually worth it to walk a little further and avoid yet another line! You might even get lucky and find real bathrooms like they had at the Art Museum that I am told were rarely used. If you think you need the bike mechanic, go early! Customers pile up quick. And if your valve stems are rattling in your wheels and you somehow never noticed that noise before race weekend, I learned that a piece of electrical tape can fix that! Hook your timing chip around your race suit as soon as you get back to the hotel so there is NO way you can forget it race morning. Be very clear which aisle has your transition spot. The brain fog of racing will interfere with all but the most basic of instructions. At Nationals each line of racks is lettered. I knew which to turn between then I practiced pacing off the steps to my bike in my expected post-swim, post-ride stride. Counting steps is quicker than slowing down to look! Look for alternative ways to exit transition with the bike in case one path has traffic. Part of a rack had collapsed where I had planned to exit, so I just headed to Bike Out a different way. Be prepared to walk to and from the race venue a LOT of times and wait in a LOT of lines - packet pickup, swim practice, bike mechanic, check bike in, race, check bike out, check bike in again, exchange jacket for another size, wait in line for Team USA sign up, race, get a beer (oh, did I just say that? 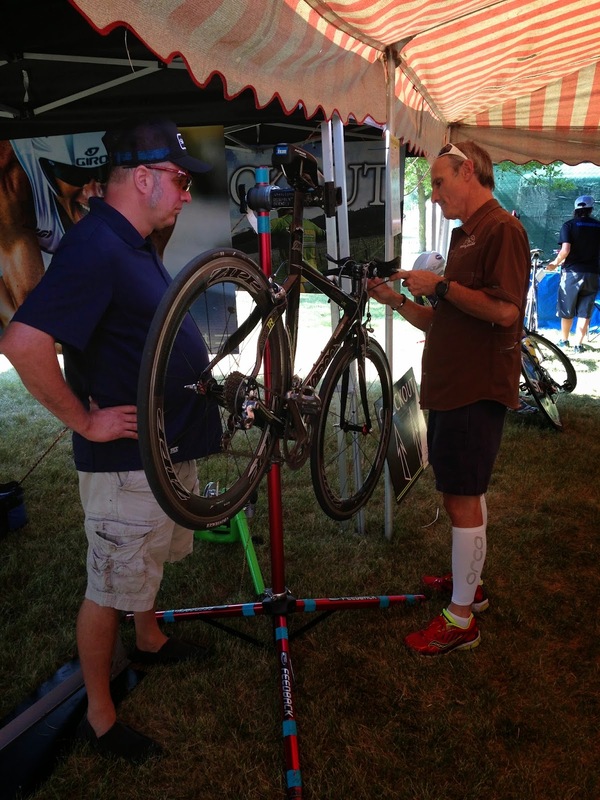 ), check bike out, wait in line for Team USA sign up. 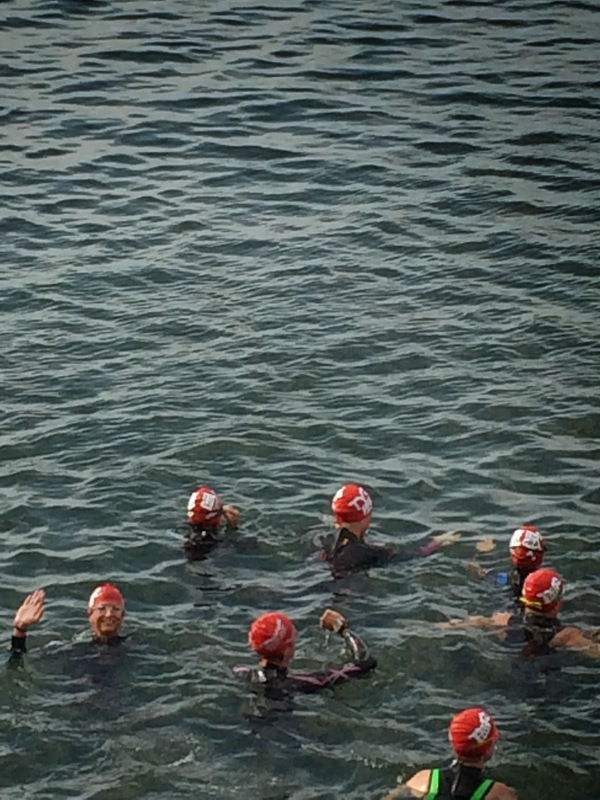 Triathletes are crazy people! Not me of course, but all those other ones! Nearly every random conversation seems to circle around to recent injuries and calamities. I saw someone on the run course in a walking boot, talked to a girl who had just placed second in a duathlon in an arm cast weeks prior, and another friend was racing post-eye-surgery! Do have random conversations and meet people. I love running into friends that I have made at Nationals and Worlds. It's an incredible community of folks. Have a sherpa, preferably an experienced one! Equipment Coach came up to cheer on the local contingent and I put him to work. Make sure your tri-tat number is right-side-up before applying (yes, I saw this). And on the subject of removing them...the secret is....nothing really works. I put lotion on and let them "ripen" for a few hours. Then remove as one does with rubber cement, just start rolling it off - preferably out on the sidewalk and not in your hotel bathroom where you'd make a mess and walk through the bits of stickiness. Eat your tried-and-true pre-race breakfast, but enjoy the local fare (within reason) for lunches and dinners! Race morning, check your bike and tires FIRST in case there is a problem! Make sure it's in the right gear for mounting. "Swimming 90% in a good draft is better/faster swimming." True that, Coach Jim. I took advantage of that, swimming from feet to feet and catching drafts as I could. 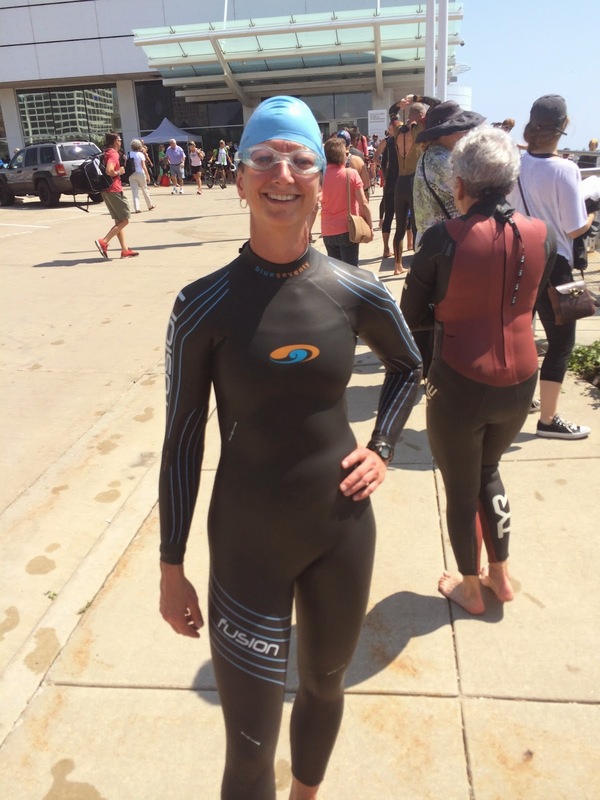 My wetsuit seemed to be sticking to me when I tried to remove it in practice, so on race day I put lotion on my legs and arms and that seemed to help quite a bit. Beware the bike mount! It's basically a minefield with roaming zombies. Be careful and get out of there as quickly and safely as possible!! I saw a lady try to ride away with a visor looped around her crank arm, I saw bikes falling over, shoes falling off. Crazy stuff. Remember the mental and physical half-way point of a run is at least 60% of the distance in so pace accordingly. Photographers are good reminders to clean up your form...and smile. It's OK to mug for the camera a bit! If you plunk down the $50 for the set of pics you might as well have some good ones. Racing is a delicate balance of patience and catching the next person. It's energy allocation. Don't overspend too much in any one place. 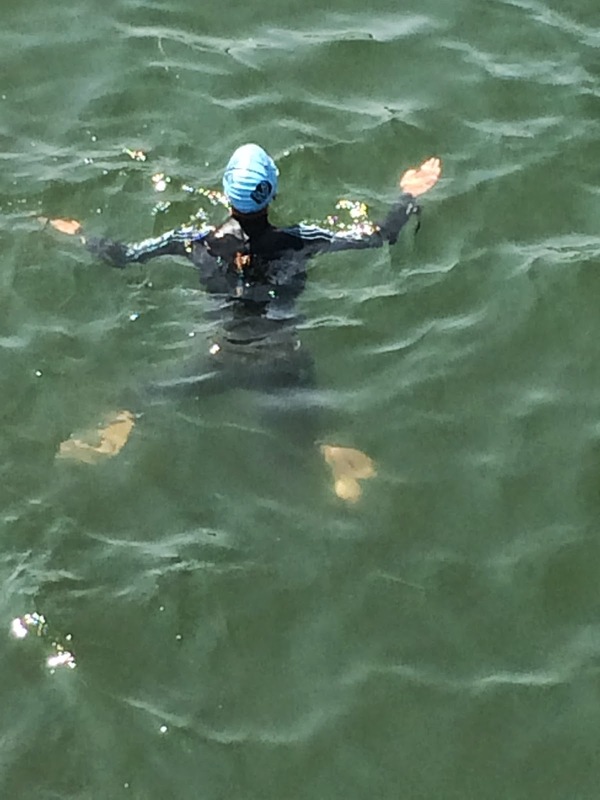 Save one extra gear for the final 400m of the run and soak it all in! 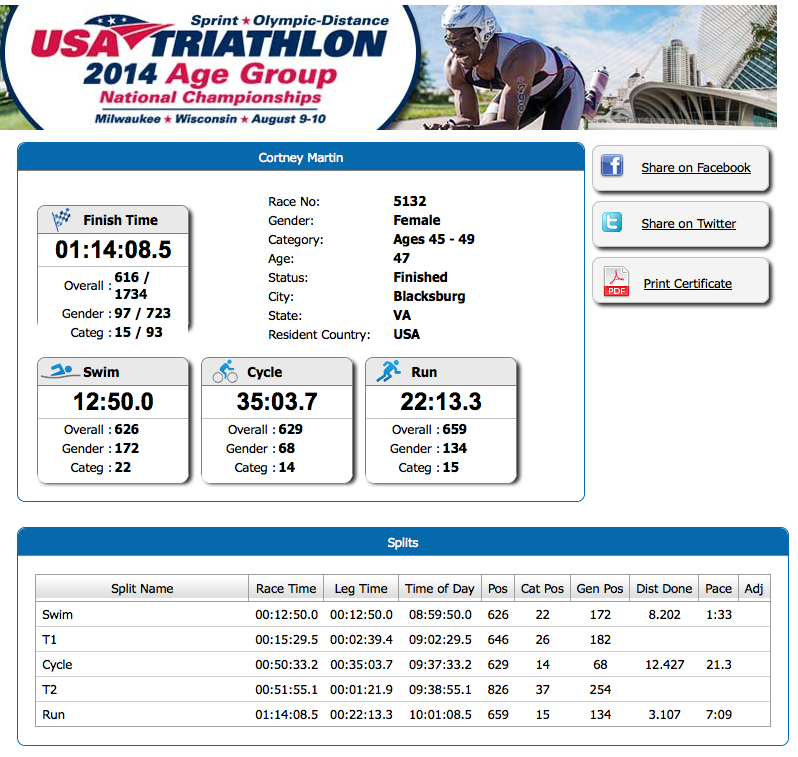 In Sunday's race I imagined all the speedy 44-year-olds ahead of me and my last mile was by far my fastest! Ship your bike to the hotel rather than fly with it! This will be the subject of a future post, but I sent my bike FedEx using BikeFlights.com and it was the easiest, best way to go by far. No searching for a cab that can fit a bike box, no watching helplessly as TSA gropes through your bike box. Age Group Nationals (and ITU Worlds), are such unique races because of the depth of talent up through every single age group. I love racing among everyone from teenagers to the 70+ year-old athletes. The head-to-head racing is a blast and while we are competitors on the course, we are compatriots afterward. 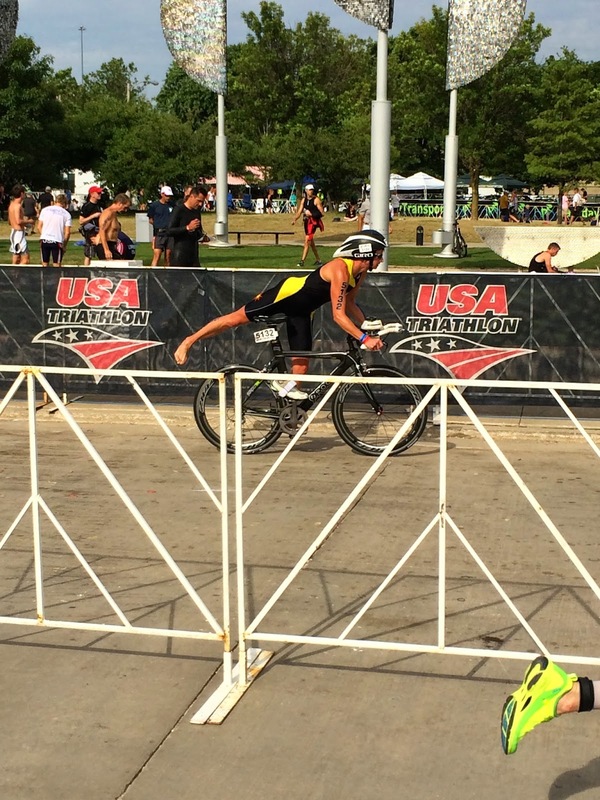 We all balance life and work and manage injuries and ride the crazy ride that is triathlon. Robert, Spencer, and Grant I appreciate the time you give me to train and race. Your support and love make it all so much sweeter. Thank you to Solar Connexion, Virginia's premier solar contractor, for the race sponsorship and support that made the trip possible. Thank you for all the cheers and support from near and far! Whatever your story, keep writing!